Today is a day for slouchy yellow sweaters and neon pink nails, for doing the crossword and then riding your new blue bike through the grey fog, for parking yourself at the greenmarket. When you’re there, you’ll want to buy olive bread, red snapper fillets, fresh mint, fat asparagus, new strawberries and some gnarly carrots, short and lumpy, with well-coiffed leafy green tops that rustle and billow with the wind from the Bay. When you get home, you’ll want to eat sugared strawberries, olive toast, carrot bread. You’ll measure your flour, mix your sugars, grate your nutmeg, but then you’ll hit a snag. Those lovely carrots, you’ll realize, have gone missing. Where could they be? You’ll check your market tote, the refrigerator, the countertop – no carrots. You’ll check those places again, and also the freezer, just for good measure, because maybe you’re going nuts and you threw them in there without realizing. You didn’t. You’ll scratch your head, because you know that you definitely bought some carrots and that those carrots were here just a minute ago. Then you’ll look towards the couch. You will see Ben there, looking guilty, crunching his jaw and holding a carrot top. He’ll say “oops,” and then you’ll say “OOPS? !” and vow not to give him any carrot bread, once you get more carrots and actually bake it, you mean. But you will give him carrot bread, because he likes it so much and because you can’t help yourself, because he is Ben and because they were just carrots, after all. 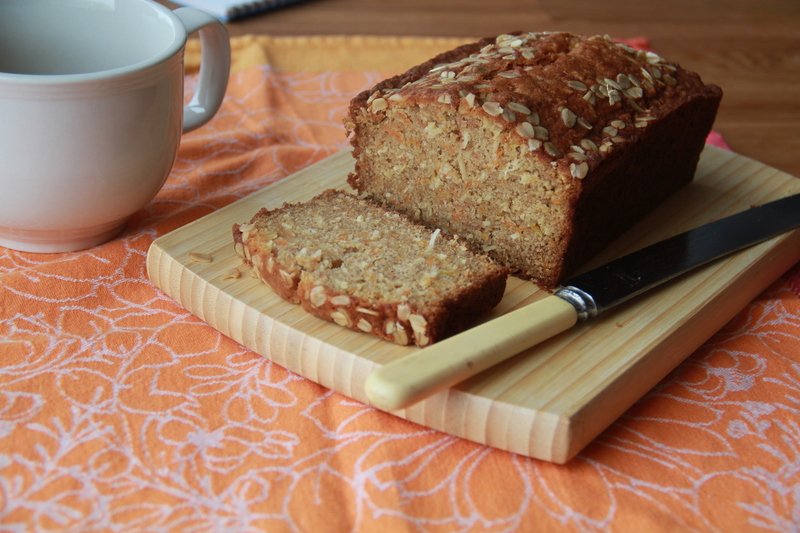 And because carrot bread, faintly sweet and speckled with coconut, is meant for sharing. Even with a carrot sneak. 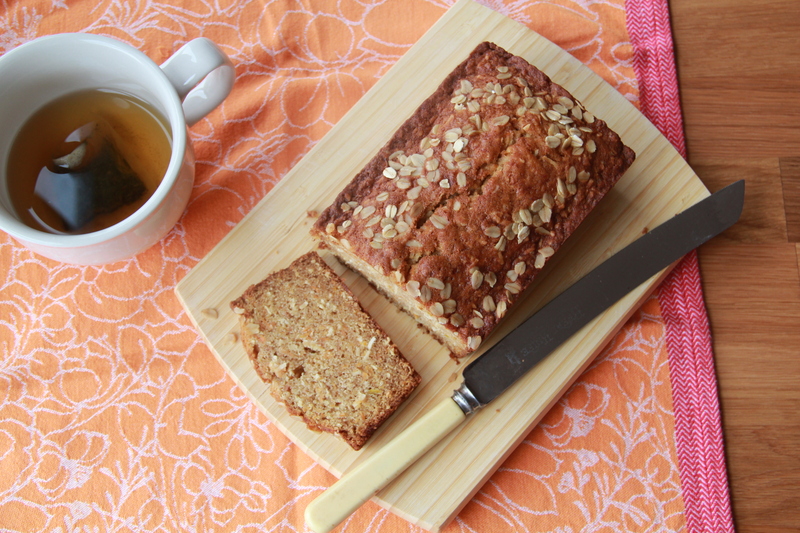 As quick breads go, this one feels quite healthy; it’s packed with grated carrot, apple and unsweetened coconut. The recipe only calls for a small bit of butter, making up the difference with coconut oil, a solid-at-room-temperature fat whose popularity in cooking seems to be on the rise. Coconut oil contains vitamins E and K, and though slightly high in saturated fat, it’s rich with lauric acid and has been shown to improve the digestive and immune systems. This recipe is a nice intro to coconut oil, if you haven’t yet tried it. Go ahead! Do it! Coconut oil! In your carrot bread! So hot right now. Preheat oven to 350 degrees F. Butter and flour a standard-sized loaf pan. In a small bowl, whisk together the flour, baking soda, baking powder, salt, nutmeg and cinnamon. Set aside. In the bowl of an electric mixer, cream together the butter and coconut oil until smooth. Add the sugars and beat until fluffy. Add the eggs, one at a time, and the vanilla, until well incorporated. The mixture may look curdled, but will smooth out once the dry ingredients are added. Next, add the grated carrot and apple, stirring to combine. Add the dry ingredients all at once, and stir gently until incorporated. Fold in the shredded coconut, and then pour the batter into the prepared pan. Sprinkle rolled oats on top. Bake until a toothpick inserted into the center of the bread comes out clean, 50 minutes to 1 hour. Cool the bread in the pan on a wire rack for 10 minutes, and then tip the pan over to invert the bread and allow to cool on its own. Bread will keep well wrapped at room temperature about 5 days. Stumbled onto your blog and loving it already. Especially the way you write. I’ve never really had carrot bread/cake with grated apples in it…is the flavour pronounced enough or is it to moisten the cake up? Welcome, Amrita! Glad you found me 🙂 Good question — the grated apples definitely just moisten the cake, their flavor doesn’t come through as strongly as the carrot and coconut here. I’ve been dying to make a “carrot cake” type loaf! This looks delicious. Love the grated apple in it. My family is the exact same way with my ingredients. I always buy things, get home and start unpacking and they go missing! This looks like a delicious vehicle for salted butter. what an awesome recipe! so glad my google search for “carrot bread with coconut oil” led me here 🙂 I made a few edits only because I didn’t have everything on hand, but it turned out super tasty. can’t wait to try more recipes!! Thanks, Christina! So glad you enjoyed the carrot bread! Hey there, lovely recipe 🙂 Im wondering though if I can make the same with whole wheat flour? Thank you! I haven’t tried it myself, but I do think whole wheat flour would substitute nicely here. At the very least, you could start with half all-purpose, half whole wheat. Good luck!